Using powershell to manage applications is no new thing, Microsoft are pushing things that way with the release of Exchange 2007 where everything in the GUI is pushed back down to the powershell console and completed there. So, Imagine if you could do that with VMware products, how amazing would that be ! I’m currently sat in Heathrow Airport Terminal 1, I have just found a nice Zurich stand where they give you place to sit, a plug for the laptop and even an Ethernet cable with free Internet access, how nice is that ! So I thought I would best use my time to upload a Quick Reference guide to the VI Toolkit, hopefully I will be handing a few of these out at VMWorld but thought I would also add it to my blog for those of you who were unable to make it. 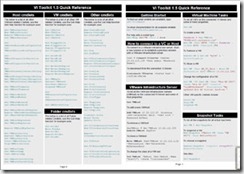 If you are interested in getting started with the VI Toolkit then print off the attached pdf file on a duplex printer, fold it in half and you have the ultimate getting started guide. Thanks to C.Shanklin, S.Herold, L.Dekens and C.Bunch for their help with the editing and for the one-liners. Are you using PowerGUI and the VMware Powerpack yet, if the answer is no then why not ? If you think its something that you will have to learn and you just dont have the time then please stop making excuses right now because VMGuru has just released some great new videos that not only show you how to get started but will also convert you into a guru. Now you can convert physical machines running Windows and Linux operating systems to VMware virtual machines quickly, reliably and without any disruption. Simplify integration by converting third-party formats such as Parallels Desktop, Symantec Backup Exec System Recovery, Norton Ghost, Acronis, StorageCraft and Microsoft Virtual Server/ Virtual PC to VMware virtual machines. Eliminate source server downtime and reboot with non disruptive conversions through hot cloning. For free you can’t go wrong. Download it now if you have any P2V’s planned.